Barbara Ehrenreich, and Danny Glover. We believe that the movement today supporting Barack Obama continues this great tradition of grass-roots participation drawing millions of people out of apathy and into participation in the decisions that affect all our lives. We believe that Barack Obama’s very biography reflects the positive potential of the globalization process that also contains such grave threats to our democracy when shaped only by the narrow interests of private corporations in an unregulated global marketplace. We should instead be globalizing the values of equality, a living wage and environmental sustainability in the new world order, not hoping our deepest concerns will be protected by trickle down economics or charitable billionaires. By its very existence, the Obama campaign will stimulate a vision of globalization from below. As progressives we believe this sudden and unexpected new movement is just what <?xml:namespace prefix = st1 ns = "urn:schemas-microsoft-com:office:smarttags" />America needs. The future has arrived. The alternative would mean a return to the dismal status quo party politics that have failed so far to deliver peace, health care, full employment and effective answers to crises like global warming. During past progressive peaks in our political history—the late Thirties, the early Sixties—social movements have provided the relentless pressure and innovative ideas that allowed centrist leaders to embrace visionary solutions. We find ourselves in just such a situation today. Pennsylvania, North Carolina, Oregon, Puerto Rico, and in the November general election. We can contribute our dollars. We have the proven online capacity to reach millions of swing voters in the primary and general election. 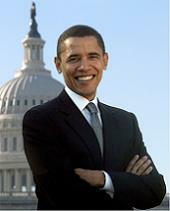 We can and will defend Obama against negative attacks from any quarter. We will seek Green support against the claim of some that there are no real differences between Obama and McCain. We will criticize any efforts by Democratic super-delegates to suppress the winner of the popular and delegate votes, or to legitimize the flawed elections in Michigan and Florida. We will make our agenda known at the Democratic national convention and fight for a platform emphasizing progressive priorities as the path to victory. However, the fact that Barack Obama openly defines himself as a centrist invites the formation of this progressive force within his coalition. Anything less could allow his eventual drift towards the right as the general election approaches. It was the industrial strikes and radical organizers in the 1930s who pushed Roosevelt to support the New Deal. It was the civil rights and student movements that brought about voting rights legislation under Lyndon Johnson and propelled Eugene McCarthy and Bobby Kennedy’s anti-war campaigns. It was the original Earth Day that led Richard Nixon to sign environmental laws. And it will be the Obama movement that makes it necessary and possible to end the war in Iraq, renew our economy with a populist emphasis, and confront the challenge of global warming. - The Iraq War must end as rapidly as possible, not in five years. All our troops must be withdrawn. Diplomacy and trade must replace further military occupation or military escalation into Iran and Pakistan. We should not stop urging Barack Obama to avoid leaving American advisers behind in Iraq in a counterinsurgency quagmire like Afghanistan today or Central America in the 1970s and 1980s. Nor should he simply transfer American combat troops from the quagmire in Iraq to the quagmire in Afghanistan. - Iraq cannot be separated from our economic crisis. Iraq is costing trillions of dollars that should be invested in jobs, universal health care, education, housing and public works here at home. Our own Gulf Coast requires the attention and funds now spent on Gulf oil. - Iraq cannot be separated from our energy crisis. We are spending an unheard-of $100/barrel for oil. We are officially committed to wars over oil supplies far into the future. We instead need a war against global warming and for energy independence from Middle Eastern police states and multinational corporations. The Bush Administration has replaced the Cold War with the War on Terrorism led by the same military-industrial complex that President Eisenhower warned against. The reality and public fear of terrorism today is no less real than fear of communism and nuclear annihilation a generation ago. But we simply cannot continue multiple military interventions in many Muslim countries without increasing the vast number of violent jihadists against us, bleeding our military and our economy, becoming more dependent on Middle East oil, creating unsavory alliances with police states, shrinking our own civil liberties and putting ourselves at permanent risk of another 9/11 attack. We need a brave turn towards peace and conflict resolution in the Middle East and the Muslim world. Getting out of Iraq, sponsoring a two-state solution between Israel and the Palestinians, ending alliances with police states in the Arab world, unilaterally initiating real energy independence and moving the world away from the global warming crises are the steps that must be taken. Nor can we impose NAFTA-style trade agreements on so many nations that seek only to control their own national resources and economic destinies. We cannot globalize corporate and financial power over democratic values and institutions. Since the Clinton Administration pushed through NAFTA against the Democratic majority in Congress, one Latin American nation after another has elected progressive governments that reject US trade deals and hegemony. We are isolated in Latin America by our Cold War and drug war crusades, by the $500 million counter-insurgency in Columbia, support for the 2002 coup attempt in Venezuela, and the ineffectual blockade of Cuba. We need to return to the Good Neighbor policies of Franklin D. Roosevelt in the 1930s, which rejected Yankee military intervention and accepted Mexico’s right to nationalize its oil in the face of industry opposition. The pursuit of NAFTA-style trade policies inflames our immigration crisis as well, by uprooting countless campesinos who inevitably seek low-wage jobs north of the border in order to survive. We need balanced and democratically-approved trade agreements that focus on the needs of workers, consumers and the environment. The Banana Republic is a retail chain, not an American colony protected by the Monroe Doctrine. We are pleased that Hillary Clinton has been responsive to the tide of voter opinion this year, and we applaud the possibility of at last electing an American woman president. But progressives should be disturbed at her duplicitous positions on Iraq and NAFTA. She still denies that her 2002 vote for legislation which was called the war authorization bill was a vote for war authorization. She now promises to “end the war” but will not set a timeline for combat troop withdrawal, and remains committed to leaving tens of thousands of counter-terrorism troops and trainers in Iraq amidst a sectarian conflict. While Obama needs to clarify his own position on counterinsurgency, Clinton’s “end the war” rhetoric conceals an open commitment to keep American troops in Iraq until all our ill-defined enemies are defeated—a treadmill which guarantees only the spawning of more enemies. On NAFTA, she claims to have opposed the trade deal behind closed doors when she was First Lady. But the public record, and documents recently disclosed in response to litigation, proves that she was a cheerleader for NAFTA against the strong opposition of rank-and-file Democrats. The Clintons ushered in the Wall Street Democrats whose deregulation ethos has widened inequality while leaving millions of Americans without their rightful protections against market shocks. Clinton’s most bizarre claim is that Obama is unqualified to be commander-in-chief. Clinton herself never served in the military, and has no experience in the armed services apart from the Senate armed services committee. Her husband had no military experience before becoming president. In fact he was a draft opponent during Vietnam, a stance we respected. She was the first lady, and he the governor, of one of our smallest states. They brought no more experience, and arguably less, to the White House than Obama would in 2009. We take very seriously the argument that Americans should elect a first woman president, and we abhor the surfacing of sexism in this supposedly post-feminist era. But none of us would vote for Condoleeza Rice as either the first woman or first African-American president. We regret that the choice divides so many progressive friends and allies, but believe that a Clinton presidency would be a Clinton presidency all over again, not a triumph of feminism but a restoration of the aging, power-driven Wall Street Democratic Hawks at a moment when so much more fresh imagination is possible and needed. A Clinton victory could only be achieved by the dashing of hope among millions of young people on whom a better future depends. The style of the Clintons’ attacks on Obama, which are likely to escalate as her chances of winning decline, already risks losing too many Democratic and independent voters in November. We believe that the Hillary Clinton of 1968 would be an Obama volunteer today, just as she once marched in the snows of New Hampshire for Eugene McCarthy against the Democratic establishment. We did not foresee the exciting social movement that is the Obama campaign. Many of us supported other candidates, or waited skeptically as weeks and months passed. But the closeness of the race makes it imperative that everyone on the sidelines, everyone in doubt, everyone vacillating, everyone fearing betrayals and the blasting of hope, everyone quarreling over political correctness, must join this fight to the finish. Not since Robert Kennedy’s 1968 campaign has there been a passion to imagine the world anew like the passion and unprecedented numbers of people mobilized in this campaign. TOM HAYDEN is author of Ending the War in Iraq, a five-time Democratic convention delegate, former state senator, and board member of the Progressive Democrats of America. BILL FLETCHER, JR., who originated the call for founding “Progressives for Obama,” is the executive editor of Black Commentator, and founder of the Center for Labor Renewal. BARBARA EHRENREICH is the author of Dancing in the Streets(2007) and other popular works and, with Hayden, a member of The Nation’s editorial board. DANNY GLOVER is the respected actor, activist, and chairman of the board of TransAfrica Forum.